Mom Among Chaos received tickets to this show. All opinions are my own. This blog contains affiliate links. 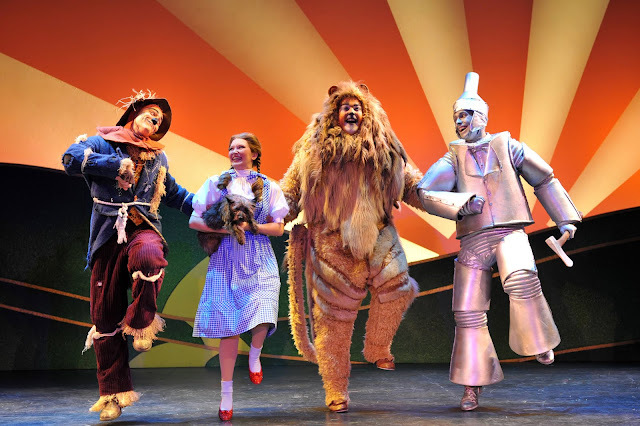 The greatest family musical of all time, The Wizard of Oz, is touching down in Detroit at the Fox Theatre Saturday, November 25 through Sunday, November 26 as part of the Fifth Third Bank Fox Theatre Series. Tickets (Start at $30) are on sale now and can be purchased at OlympiaEntertainment.com, The Fox Theatre and Joe Louis Arena box offices and Ticketmaster.com. To charge tickets by phone, call (800) 745-3000. For additional information, call (313) 471-6611. Series subscription packages and discounts for groups of 10+ are available by calling 313-471-3099. This magical production is a celebration of the 1939 MGM movie and will be presented with breathtaking special effects that will sweep audiences away, from the moment the tornado twists its way into Kansas. Dean Sobon will serve as the Director and previously created the national tours of Fiddler on the Roof and Seven Brides for Seven Brothers. Amy McCleary will create the magical choreography and was the Director/Choreographer of the national tour of Memphis, the Musical and the choreographer of the national tour of The Wedding Singer. The team of Sobon and McCleary will take Dorothy, Toto and their friends the Cowardly Lion, Tin Man and Scarecrow “Over the Rainbow” to adventures in Munchkin Land, the Haunted Forest and the Emerald City. Featuring the classic songs, as composed by Harold Arlen, “Over the Rainbow,” “Ding Dong the Witch is Dead” and “If I Only Had A Brain,” along with the beloved characters, The Wizard of Oz will have the entire family captivated as they travel down the yellow brick road for an unforgettable day at the theater. Saturday, November 25 7:30 p.m.
Sunday, November 26 1:30 p.m. & 6:30 p.m. Enter to win a family 4 pack to see Wizard of Oz at the Fox Theatre in Detroit on 11/25/17 at 7:30 PM.